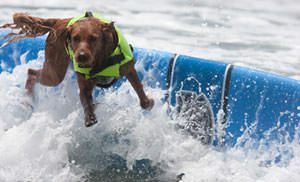 ​In addition to competitions, Ricochet surfs for fun. 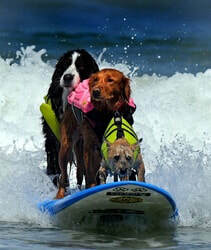 She also enjoys tandem surfing with people, and other dogs. 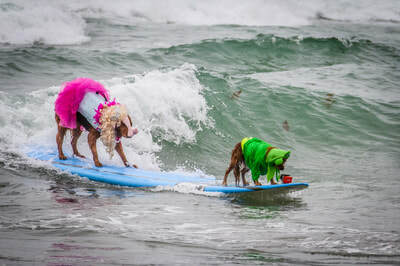 She often surfs with her littermate, Kalani, and they're known as the Twisted Sisters! 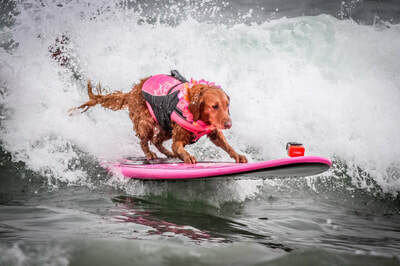 She also surfed with three of her surfing dog buddies, four dogs on a board, and their picture was featured in Times Square and the Vegas strip. 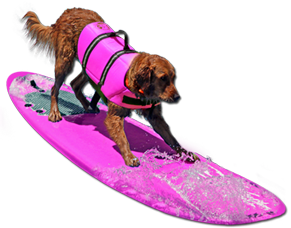 She's most at home on a surfboard, and can surf backwards, forwards, do turns, lower her center of gravity and shift her weight to keep from wiping out. 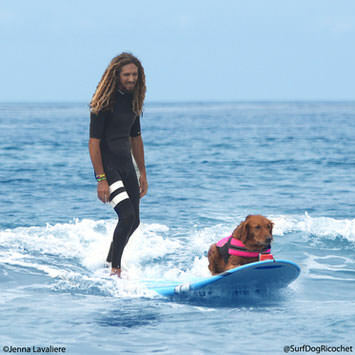 Sometimes Ricochet gets out for a little SUPing too, and she's always up for surfing with a pro surfer like Rob Machado, Guy Takayama or Taylor Knox! 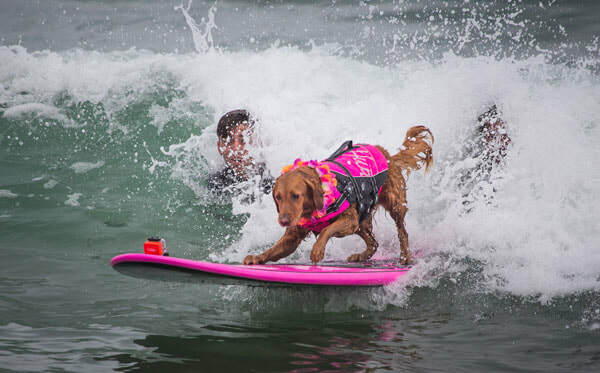 And, if you want your dog to be one of the surfing dogs at the next contest, visit our Teach Your Dog to Surf page, and scroll down for more training tips. 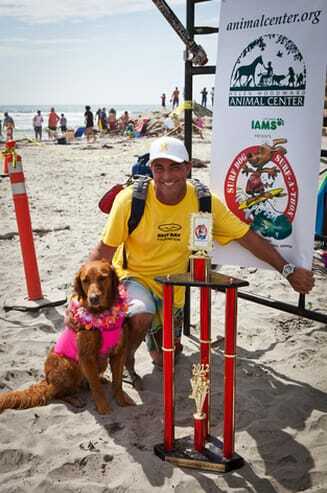 This contest is held in Huntington Beach, CA. 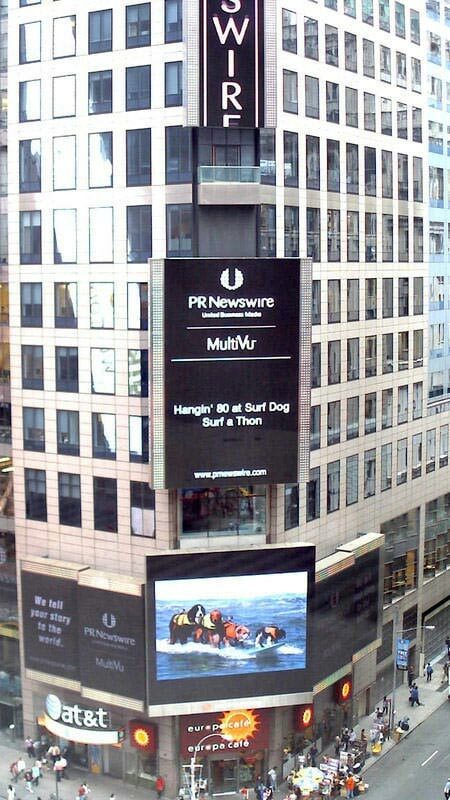 It benefits six different animal charities. In 2009 (their inaugural year), they invited Ricochet to be a charity partner. That's when she was fundraising for Patrick Ivison, the 14 year old boy who was run over by a car when he was a toddler and became quadriplegic. 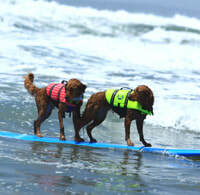 In addition to raising funds, Patrick and Ricochet also did a tandem surf demonstration. 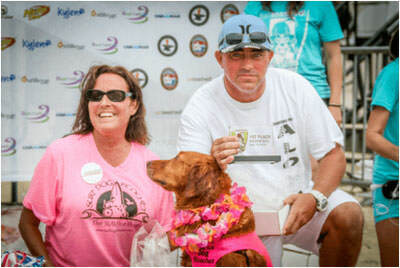 In 2010 and 2011 she was invited to again be a charity partner, and this time she fundraised for canine cancer. 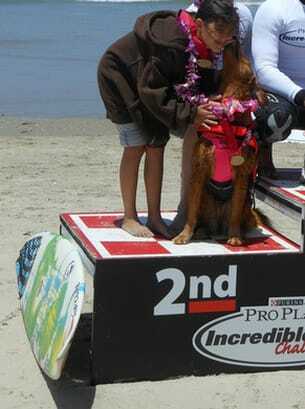 The Loews Coronado Bay Resort Competition was the first contest in San Diego. 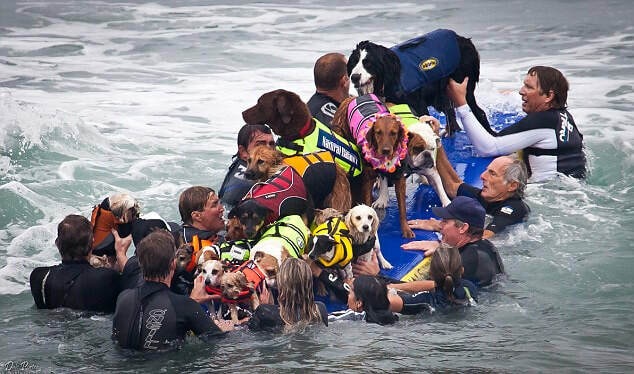 The beneficiary of this contest is the ASPCA. 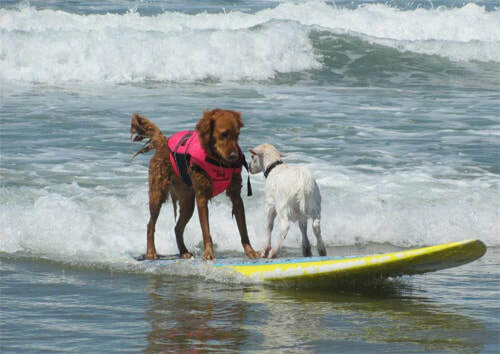 In 2011 Ricochet won the Dog of the Year from the ASPCA, so it was great to know her surfing was benefiting them! 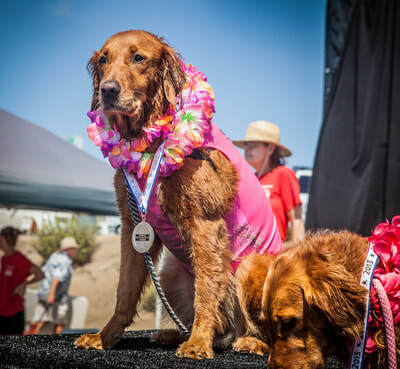 ​The Purina Incredible Dog Challenge holds a very special place in our heart. 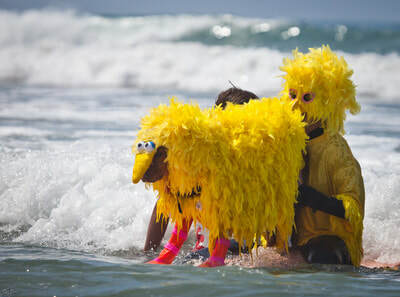 It was the first contest Ricochet entered at 15 months old. 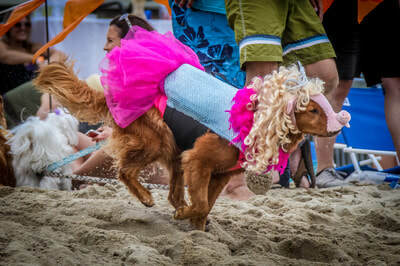 She won 3rd place! 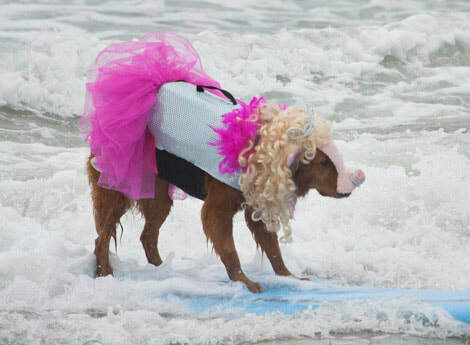 It was that day on the beach when we realized she was good at surfing. 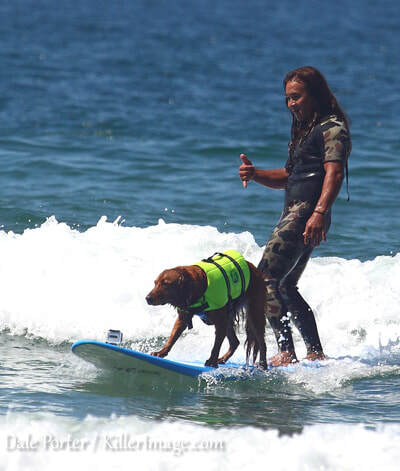 Her title changed from service dog to SURFice dog®! 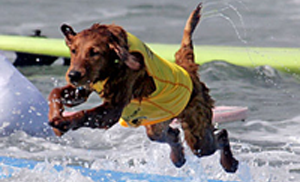 Ricochet won several of the Helen Woodward Animal Center Surf a Thon Dog Surfing Competitions. But, more importantly, she was the highest fundraiser for four years in a row! Each year she raised more than the year before. 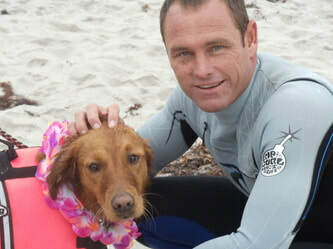 These efforts saved the lives of homeless animals. Entered when Ricochet was 7 months old, but didn't win!